Born Declan Patrick MacManus in London, he is the son of Ross MacManus who sang with The Joe Loss Orchestra. Young Declan moved with his Liverpool-born mother to Birkenhead in 1971 where he formed his first band, a folk duo, and after finishing secondary school he moved back to London and formed a new band he called Flip City. In 1974 pub rock was all the rage and that's what they played for two years, with Declan adopting the stage name of D.P. Costello - his father had performed under the name Day Costello. Music was not a full time job and Costello worked as a data entry clerk among other things to support himself. He recorded various demos, which resulted in a deal with the legendary Stiff Records and it was Jake Riviera at Stiff that suggested combining Elvis and Costello. His debut for Stiff was 'Less Than Zero', released in March 1977. followed two months later by the album, My Aim Is True, the cover featuring Costello in his Buddy Holly type glasses; it made No. 14 in the UK and, later, Top 40 in the US. In the wake of the album's release Costello was arrested for busking outside CBS Records, protesting that no US record company would release his records; Costello signed to CBS's Columbia Records in America shortly afterwards. Costello's next release was the single, 'Watching the Detectives', recorded with members of Graham Parker's band, The Rumour before later in 1977, forming The Attractions, consisting of Steve Nieve (piano), Bruce Thomas (bass guitar), and Pete Thomas (drums; he's no relation to Bruce Thomas). His third album, Armed Forces, which was originally to be called Emotional Fascism, includes the single 'Oliver's Army, which went to No. 2 in the UK, along with the brilliant, 'Accidents Will Happen'. The following year's album release was Get Happy! !, a soulful album reflecting Costello's love for the music, which includes, 'I Can't Stand Up for Falling Down'; an old Sam and Dave song. 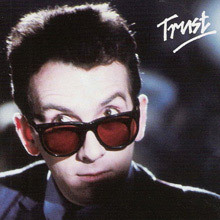 In 1981, Costello released Trust with 'Watch Your Step' and 'Clubland' coming out as singles along with, 'From a Whisper to a Scream', a duet with Glenn Tilbrook of Squeeze that became the first of Costello's singles to miss the UK charts in four years. Costello has always had a great love for country music George Jones in particular and so as a follow-up album he made, Almost Blue. It features classic country songs including Hank Williams's, 'Why Don't You Love Me (Like You Used to Do? )', and Gram Parsons's 'How Much I Lied'. In the UK it carried a sticker on the cover: "WARNING: This album contains country & western music and may cause a radical reaction in narrow minded listeners." George Jones's 'Good Year for the Roses' included on the album reached No. 6 in the UK. 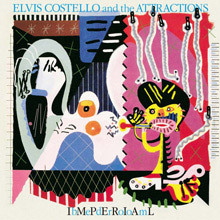 1982's, Imperial Bedroom was a return to more familiar Costello territory, although it was a generally darker album; produced by Geoff Emerick, the engineer on many Beatles records, it is an album that is sonically superb, but did not meet with the kind of sales and critical reception of earlier albums. In 1983, he released Punch the Clock, on which he uses a four-piece horn section, The TKO Horns, alongside The Attractions. It includes, 'Shipbuilding', featuring a trumpet solo by Chet Baker who later covered, 'Almost Blue' from Imperial Bedroom. Punch the Clock also includes 'Pills and Soap', an attack on Thatcherism, and the hit single, 'Everyday I Write the Book'. In 1984 he released, Goodbye Cruel World and announced the break up of the Attractions and his retirement; fortunately it didn't last long. Following his appearance at Live Aid in 1985 he began working with T-Bone Burnett and a several of Elvis Presley's band, including James Burton and Jerry Scheff, and the result was the, King of America, an acoustic guitar-based country-sounding album. To promote the album he toured and played multiple nights in each city - one night with The Confederates (James Burton & Jerry Scheff. ), one with The Attractions, and one as a solo acoustic set. In late 1986 Costello recorded Blood and Chocolate, which was full of post-punk fervour, the kind not heard since 1978's This Year's Model; Nick Lowe who was the producer of Costello's first five albums produced the album. There were no hit singles, but it did include what has become one of his in-concert staples, 'I Want You.' In 1989, Costello released Spike, which included his biggest American hit single, 'Veronica'; it's one of several songs Costello co-wrote with Paul McCartney during this time. In 1991, Costello released Mighty Like a Rose, which featured the single 'The Other Side of Summer.' Two years later in a radical departure from his normal records Costello worked with the Brodsky Quartet to create The Juliet Letters, with its classical overtones. In 1994 Costello returned to rock and roll for the album, Brutal Youth that saw him reunited with the Attractions. In 1995, Costello released Kojak Variety, an album of cover songs recorded five years earlier, and followed in 1996 with an album of songs originally written for other artists, All This Useless Beauty. In 1998, Costello signed to Polygram Records, and for his first release it was another radical departure from what some may consider Costello territory. A collaboration with Burt Bacharach produced the song, 'God Give Me Strength' for the movie Grace of My Heart that spawned the brilliant album, Painted From Memory, Costello then recorded Bacharach's 'I'll Never Fall in Love Again' for the soundtrack to Austin Powers: The Spy Who Shagged Me. He also collaborated with Paddy Moloney of The Chieftains on 'The Long Journey Home' for the Disney mini-series of the same name; the soundtrack won a Grammy. The following year his version of the Charles Aznavour song, 'She' was featured on the soundtrack of the film Notting Hill. In 2000, Costello was artist-in-residence at UCLA where he wrote the music for a ballet. He produced and appeared on an album of pop songs for the classical singer Anne Sofie von Otter, before releasing When I Was Cruel in 2002. The following year Elvis Costello & the Attractions were inducted into the Rock and Roll Hall of Fame and Elvis announced his engagement to singer and pianist Diana Krall. Later in the year he released North, which includes the beautiful song, 'Still' on which he was reunited with the Brodsky Quartet. 'Scarlet Tide', co-written by Costello and T-Bone Burnett and used in Cold Mountain was nominated for an Academy Award in 2004; he performed it at the ceremony with Alison Krauss, who sang it on the soundtrack. Costello co-wrote many songs on Krall's 2004 album, The Girl in the Other Room, her first to feature several original compositions. In July 2004, Costello's first full-scale orchestral work, Il Sogno, was performed in New York. The work, a ballet after Shakespeare's A Midsummer Night's Dream, was commissioned by Italian dance troupe. He also found time to release the album, The Delivery Man, recorded in Oxford, Mississippi. Far from running out of ideas for his more mainstream career he seemed to have found a new rich seem of great song writing and performing. In late 2005 Costello started work on a new album with legendary New Orleans producer, and performer Allen Toussaint. The River in Reverse was released on the Verve label in May 2006. The album came about after Hurricane Katrina, when Costello and Toussaint performed onstage at a series of Hurricane Relief benefit concerts. It includes the beautiful 'Freedom for the Stallion' and 'Tears, Tears and More Tears.' It is another cracking album that fully allows Costello to immerse himself in yet another musical genre and succeed in bringing a freshness to the material. 2008's album offering was, Momofuku, which initially came out exclusively on vinyl, with a download code for a digital copy. The following year Costello released Secret, Profane & Sugarcane, a collaboration with T-Bone Burnett; it was return to the country feel of Almost Blue. National Ransom, another record with T-Bone Burnett which features guest appearances by Leon Russell and Vince Gill, completed his three in three year album release schedule in 2010. Costello has recently co-operated on the making of a TV documentary that explores his background and music in a never-before-seen manner. It will be shown later this year to coincide with his next album September 2013 on which he has collaborated with The Roots as is usual with Elvis Costello, always expect the unexpected. Elvis Costello was as much a pub rocker as he was a punk rocker and nowhere is that more evident than on his debut, My Aim Is True. It's not just that Clover, a San Franciscan rock outfit led by Huey Lewis (absent here), back him here, not the Attractions; it's that his sensibility is borrowed from the pile-driving rock & roll and folksy introspection of pub rockers like Brinsley Schwarz, adding touches of cult singer/songwriters like Randy Newman and David Ackles. Then, there's the infusion of pure nastiness and cynical humor, which is pure Costello. That blend of classicist sensibilities and cleverness make this collection of shiny roots rock a punk record -- it informs his nervy performances and his prickly songs. Of all classic punk debuts, this remains perhaps the most idiosyncratic because it's not cathartic in sound, only in spirit. Which, of course, meant that it could play to a broader audience, and Linda Ronstadt did indeed cover the standout ballad "Alison." Still, there's no mistaking this for anything other than a punk record, and it's a terrific one at that, since even if he buries his singer/songwriter inclinations, they shine through as brightly as his cheerfully mean humor and immense musical skill; he sounds as comfortable with a '50s knockoff like "No Dancing" as he does on the reggae-inflected "Less Than Zero." 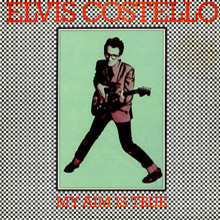 Costello went on to more ambitious territory fairly quickly, but My Aim Is True is a phenomenal debut, capturing a songwriter and musician whose words were as rich and clever as his music. Ryko/Demon's 1993 reissue contained several bonus tracks, including the country B-sides "Radio Sweetheart" and "Stranger in the House," plus demos of his first group, Flip City. After releasing and touring the intense This Year's Model, Elvis Costello quickly returned to the studio with the Attractions to record his third album, Armed Forces. In contrast to the stripped-down pop and rock of his first two albums, Armed Forces boasted a detailed and textured pop production, but it was hardly lavish. However, the more spacious arrangements -- complete with ringing pianos, echoing reverb, layered guitars, and harmonies -- accent Costello's melodies, making the record more accessible than his first two albums. Perversely, while the sound of Costello's music was becoming more open and welcoming, his songs became more insular and paranoid, even though he cloaked his emotions well. Many of the songs on Armed Forces use politics as a metaphor for personal relationships, particularly fascism, which explains its working title, Emotional Fascism. Occasionally, the lyrics are forced, but the music never is -- the album demonstrates the depth of Costello's compositional talents and how he can move from the hook-laden pop of "Accidents Will Happen" to the paranoid "Goon Squad" with ease. Some of the songs, like the light reggae of "Two Little Hitlers" and the impassioned "Party Girl," build on his strengths, while others like the layered "Oliver's Army" take Costello into new territories. It's a dense but accessible pop record and ranks as his third masterpiece in a row. Rykodisc/Demon 1993 CD reissue of Armed Forces restored the album to its original British running order, adding the B-side cover of Nick Lowe's "(What's So Funny 'Bout) Peace, Love and Understanding" -- which had been substituted for "Sunday's Best" on the American version of Armed Forces -- as one of the disc's bonus tracks. The CD also includes the B-sides "My Funny Valentine," "Tiny Steps," "Clean Money," the free single "Talking in the Dark"/"Wednesday Week," which was included with the initial Radar pressings of Armed Forces, and the Live at Hollywood High EP, which was also included on the first Radar edition. Having gotten country out of his system with Almost Blue, Elvis Costello returned to pop music with Imperial Bedroom -- and it was pop in the classic, Tin Pan Alley sense. Costello chose to hire Geoff Emerick, who engineered all of the Beatles' most ambitious records, to produce Imperial Bedroom, which indicates what it sounds like -- it's traditional pop with a post-Sgt. Pepper production. Essentially, the songs on Imperial Bedroom are an extension of Costello's jazz and pop infatuations on Trust. Costello's music is complex and intricate, yet it flows so smoothly, it's easy to miss the bitter, brutal lyrics. The interweaving layers of "Beyond Belief" and the whirlwind intro are the most overtly dark sounds on the record, with most of the album given over to the orchestrated, melancholy torch songs and pop singles. Never once do Costello & the Attractions deliver a rock & roll song -- the album is all about sonic detail, from the accordion on "The Long Honeymoon" to the lilting strings on "Town Cryer." Of course, the detail and the ornate arrangements immediately peg Imperial Bedroom as Costello's most ambitious album, but that doesn't mean it's his absolute masterpiece. Imperial Bedroom remains one of Costello's essential records because it is the culmination of his ambitions and desires -- it's where he proves that he can play with the big boys, both as a songwriter and a record-maker. It may not have been a commercial blockbuster, but it certainly earned the respect of legions of musicians and critics who would have previously disdained such a punk rocker. And, perhaps, that's also the reason that he abandoned this immaculately crafted style of work on his next album, Punch the Clock. Where My Aim Is True implied punk rock with its lyrics and stripped-down production, This Year's Model sounds like punk. Not that Elvis Costello's songwriting has changed -- This Year's Model is comprised largely of leftovers from My Aim Is True and songs written on the road. It's the music that changed. 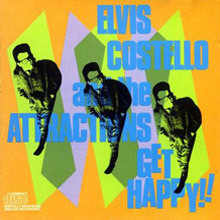 After releasing My Aim Is True, Costello assembled a backing band called the Attractions, which were considerably tougher and wilder than Clover, who played on his debut. the Attractions were a rock & roll band, which gives This Year's Model a reckless, careening feel. It's nervous, amphetamine-fueled, nearly paranoid music -- the group sounds like they're spinning out of control as soon as they crash in on the brief opener, "No Action," and they never get completely back on track, even on the slower numbers. Costello and the Attractions speed through This Year's Model at a blinding pace, which gives his songs -- which were already meaner than the set on My Aim Is True -- a nastier edge. "Lipstick Vogue," "Pump It Up," and "(I Don't Want to Go To) Chelsea" are all underscored with sexual menace, while "Night Rally" touches on a bizarre fascination with fascism that would blossom on his next album, Armed Forces. Even the songs that sound relatively lighthearted -- "Hand in Hand," "Little Triggers," "Lip Service," "Living in Paradise" -- are all edgy, thanks to Costello's breathless vocals, Steve Nieve's carnival-esque organ riffs, and Nick Lowe's bare-bones production. 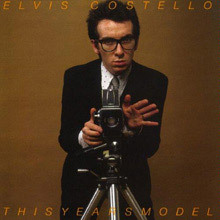 Of course, the songs on This Year's Model are typically catchy and help the vicious sentiments sink into your skin, but the most remarkable thing about the album is the sound -- Costello and the Attractions never rocked this hard, or this vengefully, ever again. This Year's Model on both sides of the Atlantic, restoring the album to its original British running order and adding six bonus tracks. The first three tracks are singles and B-sides, including the classic rant "Radio, Radio," the organ-driven '60s pop of "Big Tears," and the frenetic "Crawling to the USA." The remaining three tracks -- "Running Out of Angels," "Greenshirt," and "Big Boys" -- are all demos. Elvis Costello and Burt Bacharach first collaborated on "God Give Me Strength," a sweeping ballad that functioned as the centerpiece in Allison Anders' Grace of My Heart. It was a stunning song in the tradition of Bacharach's classic '60s work and it was successful enough that the composers decided to collaborate on a full album, Painted from Memory. Wisely, they chose to work within the stylistic parameters of Bacharach's '60s material, but Painted from Memory never sounds like a stylistic exercise. Instead, it's a return to form for both artists. Bacharach hasn't written such graceful, powerful melodies since his glory days, and Costello hasn't crafted such a fully realized album since King of America. It's a testament to both that even if the album is clearly in Bacharach's territory, it feels like a genuine collaboration. Often, the music not only evokes the spirit of Dionne Warwick, it's reminiscent of Elvis' torching ballads for Trust. 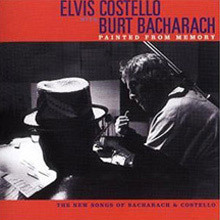 Costello keeps Bacharach from his schmaltzier tendencies, and Bacharach keeps Costello from overwriting. With its lush arrangements, sighing brass and strings, gentle pianos, and backing vocals, it's clearly a classicist album, yet it sounds utterly timeless. Its melodies are immediate, its emotions subtle, its impact lasting -- and, with that timeless sound, Painted from Memory illustrates that craft cannot only be its own reward, it can be genuinely moving. Following the frenzied pop-soul of Get Happy! 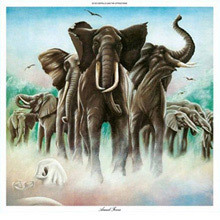 !, Elvis Costello & the Attractions quickly returned to the studio and recorded Trust, their most ambitious and eclectic album to date. As if he were proving his stylistic diversity and sophistication after the concentrated genre experiment of Get Happy! !, Costello assembled Trust as a stylistic tour de force, packing the record with a wild array of material. "Clubland" has jazzy flourishes, "Lovers' Walk" rolls to a Bo Diddley beat, "Luxembourg" is rockabilly redux, "Watch Your Step" is soul-pop, "From a Whisper to a Scream" rocks as hard as anything since This Year's Model, "Shot with His Own Gun" is Tin Pan Alley pop, "Different Finger" is the first country song he put on an official album, and that's not even counting highlights like "New Lace Sleeves" and "White Knuckles," which essentially stick to Costello's signature pop, but offer more complex arrangements and musicianship than before. In fact, both "complexity" and "sophistication" are keywords to the success of Trust -- without delving into the minutely textured arrangements that would dominate his next pop album, Imperial Bedroom -- Costello & the Attractions demonstrate their musical skill and savvy by essentially sticking to the direct sound of their four-piece band. In the process, they recorded, arguably, their most impressive album, one that demonstrates all sides of Costello's songwriting and performing personality without succumbing to pretentiousness. Elvis Costello & The Attractions - Get Happy!! Get Happy!! was born as much from sincere love for soul as it was for Elvis Costello's desire to distance himself from an unfortunate verbal faux pas where he insulted Ray Charles in an attempt to get Stephen Stills' goat. Either way, it resulted in a 20-song blue-eyed soul tour de force, where Costello doesn't just want to prove his love, he wants to prove his knowledge. So, he tries everything, starting with Motown and Northern soul, then touching on smooth uptown ballads and gritty Southern soul, even finding common ground between the two by recasting Sam & Dave's "I Can't Stand Up (For Falling Down)" as a careening stomper. What's remarkable is that this approach dovetails with the pop carnival essayed by Armed Forces, standing as a full-fledged Costello record instead of a genre exercise. As it furiously flits through 20 songs, Costello's cynicisms, rage, humor, and misanthropic sensibility gel remarkably well. Some songs may not quite hit their targets, but that's part of the album's charm -- it moves so fast that its lesser songs rush by on the way to such full-fledged masterpieces as "New Amsterdam," "High Fidelity," and "Riot Act." Get Happy!! bursts with energy and invention, standing as a testament to how Costello, the pop encyclopedia, can reinvent the past in his own image. It's impossible to consider The River in Reverse without taking the devastation Hurricane Katrina wreaked upon New Orleans into account. 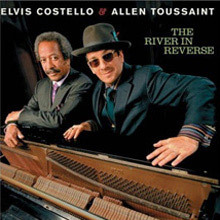 Indeed, it's quite likely that this collaboration between Elvis Costello and Allen Toussaint would not even have occurred if it weren't for that cataclysmic event. They've collaborated before -- Toussaint wrote horn charts for Costello's 1989 album Spike -- but neither had plans to work together until they appeared together at several benefit concerts for the victims of Katrina in September of 2005. That kick-started the album that became The River in Reverse. Initially, the plan was for the collaboration to be a songbook album, with Costello and Toussaint performing some highlights from Allen's rich songbook, and while the record bears some remnants of that blueprint -- seven of its 13 songs were written by Toussaint in the '60s and '70s -- the finished work evolved into an elegant, eloquent protest album crafted out of old songs and new. Costello alone wrote the title track, premiering at a benefit concert at Town Hall that September, and its angry account of the flood that wrecked New Orleans provides a touchstone for the other five new songs here, all co-written with Toussaint. "Broken Promise Land," "Ascension Day," and "International Echo" explore the aftermath of Katrina, while "Six-Fingered Man" is a funny acerbic take on a sinful sloth who is "always the first to blow his horn/His achievements multiply/Pity half of them seem to be lies." Toussaint's presence on these five songs tempers but doesn't dilute the churning anger that roils underneath The River in Reverse: "Broken Promise Land" drives along on a swampy funk rhythm, the spare and laid-back "Ascension Day" is a showcase for Allen's piano, "International Echo" revives the rolling spirit of classic New Orleans R&B, while "Six Finger Man" has a grinding, gritty blues backbeat. All five of these new songs are genuine collaborations, bearing the unmistakable stamp of both highly distinctive musicians, but the best compliment that can be paid to them is that they blend seamlessly with the classic Toussaint songs that comprise the rest of the record. When placed next to explicit songs of protest like "Broken Promise Land," such New Orleans R&B and soul staples as "On Your Way Down," "Tears, Tears and More Tears," "Freedom for the Stallion," and especially "Who's Gonna Help Brother Get Further" with its chorus of "What happen to the Liberty Bell, I heard so much about?/Did it really ding-dong?/It must have dinged wrong/It didn't ding long" take on an entirely different, politically charged meaning. 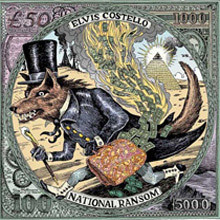 Elvis Costello has worn willful eclecticism as a badge of honor for so long that his decision to retain the same essential support and sound for 2010’s National Ransom as he did for its 2009 predecessor Secret, Profane &amp; Sugarcane means something. Building upon a foundation instead of beginning another journey suggests that he knows he has a fruitful collaboration with producer T-Bone Burnett and a good band with the Sugarcanes, who are now melded with the Imposters to give this Americana -- equal parts roots-rock, country, and pre-war balladry -- some serious kick. Secret, Profane and National Ransom share some superficial sonic characteristics, but the former played as a clearinghouse of odds and ends, while National Ransom is a purposeful album, its themes elegantly meshing together and carrying considerable momentum. Costello deliberately stays in familiar territory, often recalling his first Burnett-produced record, King of America, but he’s not churning out familiar songs -- complacency is anathema to him, of course -- he’s using the familiar sounds to provide context for the present. In a conceit that’s a shade too clever, he’s presented a year where each song takes place, but that’s a bit of misdirection, too, because modern-day tales sound ancient and vice-versa, not unlike Dylan's latter-day albums. Costello shares a similar love of Tin Pan Alley songcraft as Dylan, but he favors bluegrass to blues and betrays a little bit of artful affectation when he writes a ‘20s shuffle like “A Slow Drag with Josephine” or a ballad like “You Hung the Moon,” but that’s part of his charm: a Costello album without such punning tricks is a bit of a drag. And while National Ransom doesn’t rage like This Year's Model, it does tap into that same sense of rage on its title track, and Costello gives guitarist Marc Ribot plenty of room to strangle out notes, giving this a far less stuffy feel than Secret, Profane & Sugarcane. Ribot’s manic fretwork ties this to Costello’s dense turn-of-the-‘90s albums for Warner, so the album winds up with trace echoes of all eras of Costello, but that’s only a reflection of how National Ransom is a masterwork in the traditional sense: he’s summoned all his skills to deliver an album that summarizes his world view. 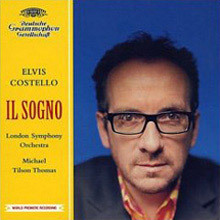 Elvis Costello has advantages over some of his peers in popular music in attempting to cross over to classical music, as he does with his first orchestral composition, Il Sogno. Since he learned musical notation and has orchestrated his music himself, he is better able to control the final work than his sometime songwriting partner Paul McCartney, for example. And by accepting a commission from the Italian dance company Aterballetto to score their adaptation of Shakespeare's A Midsummer Night's Dream (Il Sogno means "The Dream" in Italian), he has a work that gives him a dramatic structure and the further demand of accompanying dancers. These are useful limitations, and he has followed them strictly. His annotations on the play show that he has molded his music to the plot and characters, and even if the listener can't hear that in the score, there is a sense of form and development to the music. The ballet commission gives the work added functionality -- one is never too far from distinctly rhythmic material. But then, Costello brings from his popular music a sense of the need for music to command attention. Il Sogno is never a boring listen, something is always happening. A classical music fan, then, cannot criticize Costello for the usual reasons that pop composers venturing into classical music are criticized. But one criticism that can be made, from a conservative posture, is that, in achieving his effects, Costello is deliberately eclectic. He is not above borrowing a rhythmic idea from the pop song "On Broadway," as he does, for example, in "Oberon and Titania," and he has no problem introducing elements of swing jazz in "Puck 2," while leaving room for saxophonist John Harle to improvise. Also, he isn't always as restrained as he might be. A musical score for A Midsummer Night's Dream ought to be lighter and more playful than this one sometimes is; by the end, the music has taken on the contours of the soundtrack to a movie thriller, which is a bit more melodramatic than necessary. Nevertheless, Il Sogno is full of interesting themes and other musical ideas, along with striking contrasts of instruments, and it justifies both the commission and the London Symphony Orchestra's decision to record it.